Pew, pew! While testing out a virtual reality system on the International Space Station, two humans suddenly found themselves in a battle against aliens. Luckily, the contest was all digital, with the astronauts moving around in microgravity to dodge "missiles" being fired at them. A short video from the European Space Agency (ESA) shows an epic contest between NASA astronaut Scott Kelly, now just returned from a one-year mission in space, and ESA astronaut Tim Peake. Kelly raised his arms at the end — perhaps he was the victor? The video was released in March, and was recorded prior to Kelly returning from his one-year mission that month. "The game was just a bit of fun where Scott and I were being attacked by aliens from all over the place and we fired our cannons by squeezing our fingers together," Peake said in the video's caption. "We had to dodge their missiles, hence a lot of ducking and weaving going on ... much fun!" 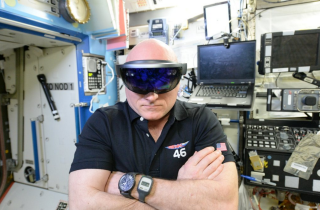 Both astronauts are wearing the HoloLens, an augmented reality headset created by Microsoft that can overlay simulated images on the wearer's view of the real world. The astronauts were participating in Operation Sidekick, which aims to employ the HoloLens to make it more efficient for astronauts to ask for help in orbit. The project has two modes: a "remote expert" that lets ground controllers see what the crewmember sees, so the controller can provide guidance, and a "procedure mode" that puts holographic images on top of an object the crew is examining. "Sidekick creates a virtual reality world on the International Space Station so we can 'drop' markers, procedures or documents in one location and they will still be there if we leave the module to return later," Peake said. "Ground control can come into our virtual world, and we can use it for doing tasks together — for example, the VR world can point out exactly what switches to flip or which screws to loosen, [what] handles to turn and even guide us to storage locations," Peake added.